British band Gorillaz visited Syria last week, giving local refugee children the chance of a lifetime through UNICEF's Refocus program. Around 20 young photographers from a refugee community in Damascus were able to meet the band and take their photographs when Gorillaz rolled into town for a live show. 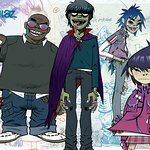 Gorillaz – a group created by Damon Albarn of Blur in 1998 which uses animation to perform – was excited to meet the young photographers and let them have a glimpse of a world seldom seen by refugees. Refocus is a grassroots organization which runs participatory photography courses for minority groups and marginalized people. Refocus puts the camera into the hands of the learners, giving them the power to depict the realities of their lives, both as individuals and as groups. They aim to improve awareness of the plight of others, create dialogue in their communities and globally, empower the participant by building confidence, self esteem and hope. To read the full account of the children’s visit with Gorillaz, click here.